UPPER MANHATTAN — City Councilman Mark Levine is in his first days of representing District 7, a radically redrawn district that now encompasses lower Washington Heights, West Harlem, Morningside Heights and the northern section of the Upper West Side. And he's gearing up to take on challenges, some of which are at a "crisis level," he said. Throughout his 2013 campaign to replace term-limited City Councilman Robert Jackson, the 44-year-old Washington Heights resident told voters he was the candidate who could best unify the district, while admitting he had his work cut out for him. 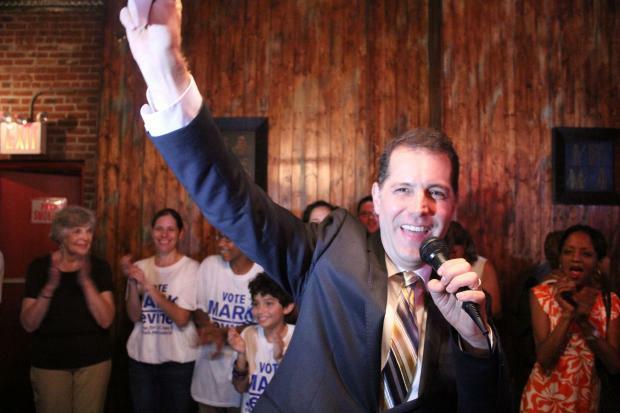 In Levine's failed 2010 state Senate bid to unseat Adriano Espaillat, he pointed to his skills in speaking Spanish and Hebrew as evidence of his ability to reach diverse groups. More recently, he faced attacks from other candidates who said that as a white Jewish man, he'd put the Upper West Side above other district neighborhoods. DNAinfo New York sat down with Levine to talk about how he plans to serve the district and take on pressing issues in each neighborhood. How do you plan to appease concerns about your ability to serve everyone in the district equally? People wanted and want someone who is going to tackle the issues — some of which are at a crisis level. Some of my biggest margins were in places like Grant Houses, where I won by a significant margin. I won in many Latino areas, many African American areas…The voters were more sophisticated than voting just based on ethnicity or race. That was heartening. There was a lot of divisive rhetoric [in the campaign], and I think you can see that that was rejected. You aren’t as well-known on the UWS and in Morningside Heights as you are in the other communities you represent. How will you make sure your constituents know you and how will you keep in touch? I’m going to be deeply, deeply involved on the West Side. We’re going to have a satellite office on 109th and Amsterdam. Our [main] office is on 141st Street and Amsterdam, in the heart of the district, and should be up and running in about two weeks. We wanted to have a satellite here, too. We’re going to be sharing it with the Columbus Amsterdam BID. This part of the district has an incredible number of pressing issues that are going to be occupying a significant amount of my time, from the JHL plan to the NYCHA Infill to the displacement of low-income tenants to St. John the Divine wanting to build a new building. In the campaign, one thing I heard remarked on was how many people met me in person. I’m going to be perpetually in the district, speaking to parent associations, tenant associations. I’m really looking forward to getting to know everyone in the district. You began your career as a bilingual teacher in The Bronx and later went on to work as the executive director of Teach for America. What are the biggest concerns you've heard from constituents about education and how will you address them? The schools in the Seventh Council District have a lot of room for improvement...with only a couple exceptions... Schools are underperforming by a lot of measures. I can identify a few means for improvement: professional development for teachers. It’s the hardest profession in America and it requires resources and support. The second is something I hear overwhelmingly from parents, which is the concern over high-stakes testing... It’s begun to distort what and how we teach in the schools. Everything that’s not on the test begins to atrophy. …forget about [teaching] music and art… and computer science. They’re of secondary importance [now.] That’s got to change. I could not agree more with the mayor about the priority of early and after-school education. The reality is there are hundreds of thousands of kids who are turned away from after-school programs because there aren't enough slots. I see it as a way of keeping kids off the streets and safe and as a way to help them develop intellectually and emotionally. [We should be] opening new ones and expanding capacity. It’s very common to have schools that don’t have enough slots... I’d like to see every school in my district have an after-school option for every child that wants it. Which projects in each neighborhood have you made it your priority to fund? I’m particularly dismayed by the atmosphere for tenants in housing court. Virtually 100 percent of landlords have attorneys and less than 10 percent of tenants have attorneys. Many tenants are low income and can't afford them. Landlords can exploit that... I’m committed to evening that playing field. I want to do it by finding legal representation for tenants. I’ve begun to talk to legal service providers. The costs in the context of the New York City budget are modest, in the neighborhood of $20 million. I’m committed to getting much more funding. In housing court, you’re on your own... It’s really Darwinian. Where will residents first see your mark as a councilman? The proposal I made on housing court is quick action. The budget will be approved in June. If I get my wish, this will be immediate impact. Another quick impact project is [creating] Select Bus Service on 125th Street. 125th Street is a vital commercial spine and transportation corridor for Upper Manhattan...But the [east-west] bus speed is approximately 3.5 miles per hour. It's slower than walking. Mass transit is moving at a crawl. This has to change. There’s a [DOT] proposal out there that could significantly improve transit. [With Select Bus Service], buses get a dedicated lane. Riders pay before they get on the bus and there are other enhancements of speed. Unfortunately the plan they’re implementing has an [SBS] bus only east of Lenox Avenue…the plan is crazy and it’s simply not justifiable based on public policy. I am committed to making the DOT make the bus lane the whole length of 125th Street. I think we could see impact on that early in 2014. Longer term, there are fabulous new piers on the Hudson at 125th Street. I would like to get a ferry operating to connect us to New Jersey — to be a transportation option for local residents and to get tourists to shop in the neighborhood. And if we can get a Citibike there, it would be truly multi-modal mass transit. The [waste] facility in our district was closed at 135th Street. I’m very happy that it was closed. West Harlem has an unconscionably long list of sites that are causing environmental impact. Now we have a massive facility — this could be everything from hydroponic organic farming to an after-school program to youth athletics. It’s an asset that the community has not really begun to develop. I want to make sure that the community is brought in right from the beginning. There’s a local nonprofit WE ACT that’s beginning to initiate a process of community input. How will you work to speed up economic development in Manhattan Valley, where many storefronts sit empty? On the one hand, we want to preserve and nurture mom-and-pop businesses that are facing pressures from rising rents that are putting them out of business at an alarming rate. We want to avoid the mass proliferation of chain stores... There’s an emerging restaurant corridor on Amsterdam Avenue as you get up to 110th Street that I think is going to become a destination. That supports local entrepreneurs. To the extent that I can help local businesses take root here and flourish, I want to do that. I think we need to examine very closely the commercial lease renewal process. Sometimes commercial tenants are forced out with little recourse. That’s bad for the entrepreneur, and the community loses something. It’s happening on the West Side at an alarming rate. The other issue is getting credit... I want the city to do much more to make sure small businesses have access to capital. I’ve been in touch with many residents who think there are niche businesses that are missing, like good green grocers. So I’ll work with local residents to find out their needs. To the extent that I can be a liaison to entrepreneurs and encourage them to take a chance, I want to do that. What is your position regarding the development of a new Jewish Home Lifecare nursing home on West 97th Street? And if you oppose it, how do you plan to help halt the development? I’m against it. This project will have a dramatic environmental impact. The construction process will have an impact on air quality, noise and safety. Traffic will be a concern. The strain on mass transit. Loss of light, air, green space. We have to hold JHL accountable. The community has succeeded in forcing JHL to do an environmental impact statement. We need to understand the environmental impact. I am particularly concerned that this development site will stand in front of an elementary school... Can you imagine being a third-grader having jackhammers outside your window? The families of the students need to be heard. This deal is not moving forward until all the regulatory hurdles are met, and we’re going to make sure that all the needs of the community are heard. Similarly, do you support NYCHA's Infill program? If not, how will you navigate the issue? For me it’s very simple. The residents of [Frederick Douglass Houses] have to be treated as full stakeholders. NYCHA has to stop imposing things on them. Douglass Houses residents have been under siege from lack of maintenance for years. There's a backlog of repairs. There are families with leaky pipes and mold. NYCHA has been under-investing in NYCHA for years. To then take away green space, to add strain on public transportation and parks, and to do it in a way that’s imposed on NYCHA residents is unacceptable. For Bloomberg, it was an attempt to ram it through and to get contracts signed on this before he left office. There are legitimate funding shortfalls in NYCHA that we unambiguously have to address. I’m confident [Mayor de Blasio] will do it in a way that treats [residents] as stakeholders. How will you address the concern of residents in parts of Harlem that minorities will continue to lose elected representatives who look like them as the neighborhood gentrifies? First of all, I identify as a highest priority for me as a councilmember protecting tenants against abusive landlords so that residents who have been here for decades are not pushed out just as things are getting turned around. There’s much more that the city and state can do to fight displacement. I’m committed to fighting it. I’m committed to opening up the political process to increase transparency… One way I want to do that is through participatory budgeting. Capital money isn’t just doled out by the decision of the councilmember but by direct participation from the residents. Progressivism at its best wins because it builds diverse coalitions. What are your thoughts about how to work with Columbia University on its expansion and how are your responding to complaints from the community that it isn't benefiting enough from the project? Columbia has to be held accountable. They made significant promises to win approval for that campus. They promised to hire locally, to hire women, minorities... to support nonprofits and fight displacement. It will be a 30-year agreement, and every day of that we have to ask, "Is Columbia living up to its promises?" When they are living up to it I will congratulate them, and when they're not I’ll hold them accountable. What type of pressure are you looking to put on the New York City Economic Development Corporation about the tourist helicopters that have been flying over Washington Heights and disturbing residents? And how will you find a solution? This is so unfair that residents of just a couple blocks are now bearing this burden of having constant constant noise of low-flying helicopters, many of whom are violating laws by flying so low. That flight path takes all of them directly over this little stretch between 155th and 158th — the most dense residential developments that are being hit by this. It’s terrible. These families have young kids. They can’t sleep. It’s simply not fair. I get that the tourist industry needs this, but it’s simply not fair. I’m going to fight really hard to get those flight paths changed. Do you have any plans to help the NYPD tackle the drug problems that residents say are plaguing Amsterdam and St. Nicholas avenues near 156th Street? We need cops on the beat. On the streets. We need them out of the precinct and out of the squad cars. We need the eyes and ears of the precinct present on those streets. I’m going to work closely with the 30th Precinct, because it’s a threat to public safety and quality of life for residents.